As you know, I re arranged my whole house. I started with putting the dining room table in the kitchen and I love it so much more. We never sat at the dining table in the formal dining room. It just never happened. The boys would be in the living room and I would always be in the kitchen. Depressing! But now that the kitchen and living room are combined, We're always together and eat together at the table when my husband isn't working. I told you I finished the sticky tiles to cover up my old back splash and I'm loving it. They look like real tiles and it was so easy to put up. You can find them HERE I also took off the cabinet doors to our main dish cabinet. I've been getting rid of things I don't love anymore and that includes our old plastic cups and dishes. I want everything in my house to be pretty and functional so I started with taking off the doors to make open shelving to motivate myself to get the ugly stuff out. I painted the inside of the cabinet white all while my husband was in the other room watching a movie. He thought I was being too quiet so he came in and just dropped his head haha. He should be used to it by now, right??!! I love how it turned out and love not having all those plastic dishes we never use. Bjorn's plastic stuff and all of our coffee mugs and water bottles are in the cabinet next to it so only the pretty things are displayed but we use the pretty things everyday so it's also super convenient. I've gotten a lot of things off of the counter and decantered all the things we use a lot. All my stuff for my shakes is on the counter in pretty jars. I feel it lightens things up and you can see the pretty back splash now. I got that adorable step ladder at a thrift store the other day. It was originally raw wood and silver hardware. I immediately painted it white and put some rub n buff on the hardware to make it copper. You can see how I updated my light and faucet with rub n buff and what color I used HERE. Bjorn loves getting on it while I do dishes and cook. He says he's "helping". I'm not gonna lie, I already put away the Christmas décor. I'll leave some out for winter but It just started to feel stuffy. I took these pictures the day before Christmas and took everything down Christmas. I know, i'm un american but I couldn't take it anymore. I think because I moved the house around, all I want to do is clean and declutter. 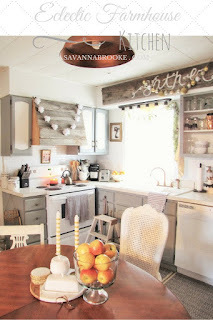 I hope you enjoyed our kitchen update and are enjoying seeing how we changed the house around. Our house just functions so much better now. I had a couple friends over the other night after I did it and they said it felt so much more inviting this way. I love that. Have a wonderful week my sweet friends and as always thank you for stopping by to see what I'm up to over here!!! Don't forget to enter the giveaway I'm having on my Facebook! Link is below!